She distributed the school uniform. Safety goggles, heavy-duty rubber gloves and anti-toxic splashback aprons vital for personal hygiene these days. The topics under discussion in the lab that morning, she announced, would be strong alkalis, inorganic compounds, mono-unsaturated fatty acids, essential hydrosols, shea body butter, bespoke floor cleaners and rash-friendly bath bombs. Miss Heathcote-James handed out the apparatus. A Pyrex jug, spatula, small hand whisk and two stainless steel saucepans. 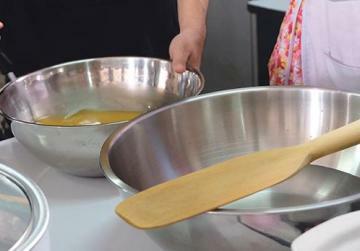 Tin, iron, aluminium and “Teflon” being forbidden on school grounds. Then the ingredients – pomace olive oil, coconut and palm oil, bottled water (filtered rain not being available ), peach kernel nutrient oil and my chosen fragrance, Evening Primrose (13ml) . And, most important of all, the NaOh. Sodium hydroxide is an indispensable ingredient of the core curriculum at the UK’s only soap-making school. Emma Heathcote-James runs the “Little Soap School” in Upper High Street, Broadway in Cotswolds. A Birmingham University theology graduate and former TV researcher, her soap-making school attracts students from around the world,all wishing to be educated in the art of saponification. Artisanal handmade soap is big business. There are now over 300 independent soap makers in the UK. Hobbies have become jobs. Emma now supplies major supermarket chains. 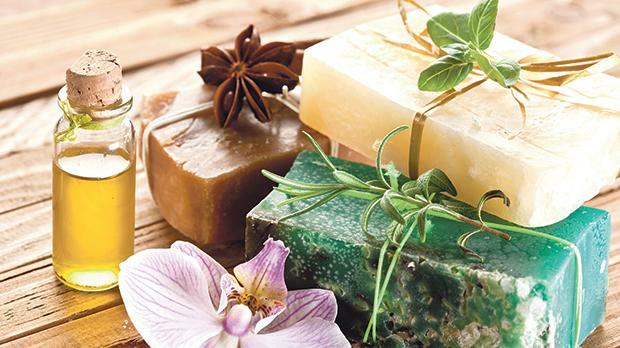 “Soap-making is great fun and very satisfying but you can’t be complacent around hazardous chemicals. Handling caustic soda is dangerous. Following her instructions, I lined my mould with greaseproof paper, weighed out my NaOh and water, opened a window, took a deep breath, poured and left the room. In a hasty but orderly manner. Emma also teaches her pupils to make runny honey lip balm, bath fizzers and their own personalised floor scourers. The lesson ended, my effort stored away to incubate overnight at room temperature. In the afternoon students make as much soap as they can. Twenty-four bars is good going. I returned the next morning, meeting the head in her study. It was like waiting for an exam result. “Very good. Eight out of ten,” announced my private suds tutor, analysing my bar from all sides. I felt proud of my handiwork, having worked years on developing my own signature body odour. Clearly, I wasn’t feeling linguistic. It didn’t all start with Body Shop. And the aloe vera movement. Pears glycerine soap was first made in 1807 by a barber and son of a Cornish farmer. 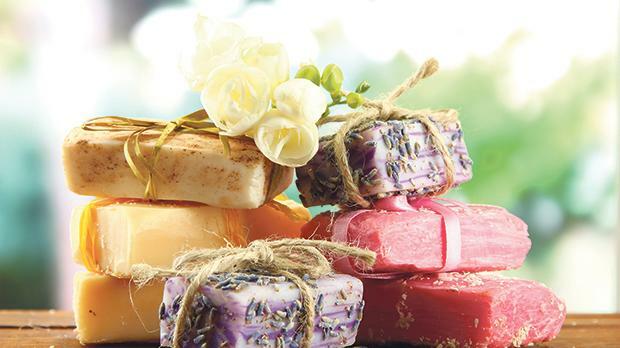 The lavender soaps of Yardley go back to 1887. Lifebuoy was first made in 1895, to fight cholera in London. Originally called Sunflakes (1899), Lux in 1925 became the first mass-manufactured toilet soap. Tallow and pure vegetable oil soap makers Kays of Ramsbottam in Bury, Lancashire is over 100 years old. Scotland’s oldest soaper is The Caurie, based in Kirkintilloch, Glasgow. Using organic herbs it produces nettle soap. The “soaperie” first started lathering in 1922. It is still owned by the Little family. In 1989, Janet Russell set up another now successful Scottish kitchen table concern, Arran Aromatics, opening its first shop in Glasgow in 2006. It still has a boutique on Brodick pier. Moving to an old dairy farm, the milking pens became the soap factory and the cow sheds the production centre. Its ranges includes “Seaweed & Sage”. In Northern Ireland, Ryan Armstrong’s new Belfast Soap Company churns out hand-crafted liquorice soap. Samantha Jones of Wales’s The Sugar Loaf Soap Company near Crickhowell produces “Sweet Orange, Walnut & Spice”. “I bought some snail soap in Morocco,” says Emma who makes organic English peppermint and poppy seed, using Icelandic volcanic ash, Tanzanian avocado and unperfumed oatmeal. She also makes “Little Beast” eco-friendly pet bath soap. The Little Soap Company began in 2019. Hand-finished, hand-cut and hand-wrapped organic soaps were first stocked by Waitrose.